Composer, pianist, conductor, legend of Polish amusement music. 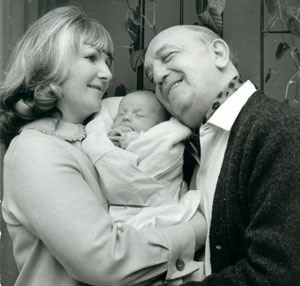 He was born on 20th April, 1895 in Warsaw as a son of Jakub and Paulina of Melodysta. He came from a musical family - his Mother and sister were pianists, his brother Józef was violinist, his second brother - Stanisław - was pianist. He received his first piano education from his Mother, Paulina. After high school graduation he studied at the Music Conservatory in Warsaw, in the piano class by Aleksander Michałowski. He finished his studies in 1916. In 1920 he went to Vienna, where he studied playing piano, composition and conducting by Prof. Arthur Schnabel. 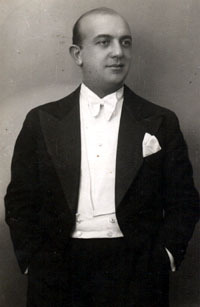 The outstanding opera-composer Emerich (Imre) Kalman appraised Jerzy Petersburski's talent enthusiastically, encouraging the young man to undertake light music. The future showed how accurate was Kalman's assessment who with time befriended the Polish musician and composer. Jerzy Petersburski cooperated also with cabarets and little theatres - Miraż, Czarny Kot, Morskie Oko, Qui Pro Quo. He was composing hit after hit. He wrote "Już Nigdy" for Wera Bobrowska, for Hanka Ordonówna "Sam mi mówiłeś", for Adolf Dymsza "Ja i żonka ma", for Ludwik Sempoliński "Cała przyjemność po mojej stronie", for Tola Mankiewiczówna and Aleksandra Żabczyńska "Ty, miłość i wiosna". In 1928 he wrote the hit of his life "Tango Milonga" for Stanisława Nowicka, which under the title of "Oh, Donna Clara" became famous worldwide. In 1936 he wrote a similarly famous hit "To Ostatnia Niedziela". Due to the moving music of Jerzy Petersburski as well as Zenon Friedwald's lyrics talking about the parting of two people, "To Ostatnia Niedziela" was called the tango of suicides. In 1936 he received a Merit Cross as "the first Polish composer, whose music crossed our borders". Among Jerzy Petersburski's works there are also two operettas - "Kochanka z ekranu" and "Robert i Bertram". Moreover, he composed music to four films - "Królowa przedmieścia", "Co mój mąż robi w nocy", "Szczęśliwa trzynastka" and "Uwiedziona". In Adria, the king of tango - that is how Petersburski was called - performed with the Gold & Petersburski orchestra for eight years. The song "Nie ja, nie ty" under the French title "Amour disait follie" was sung by Edith Piaf. Vienna, Soviet Union, Egypt, Brasil, Argentina - these are the next places where he lived and composed. In the Soviet Union he wrote another great hit "Niebieska chusteczka", which after the war started to make international career - in 1945 was popularized in France under the title "Le chale bleu", then in England "Blue shawl" and Argentine "El panuelo azul". In the broadcasting station in Kairo he hosted the series of programmes - Polskie Godziny. He also gave concerts there in front of gen. Władysław Sikorski himself. In Argentina, where he spent twenty years, together with other duties he played a role of a band master in the Teatro El National in Buenos Aires, he was conducting among others "My Fair Lady". The song of Jerzy Petersburski "Wszystkie drogi prowadzą do Buenos Aires" gained so immense popularity, that one of the main broadcasting stations in this town adopted the first tacts of the song as a radio signal. After his wife's death - Maria of Minkowski - during the earthquake in 1967, he moved to Venezuela. In order to commemorate her he composed the piece "Płaczące pianino". In the evening of his stormy life in 1967 he came back to his home country. He married the famous opera singer Sylwia Klejdysz and in 1969 his son Jerzy - Junior was born. He died in Warsaw on 7th October, 1979. Till today, the works of Jerzy Petersburski are performed in the whole world - "Tango Milonga" - "Oh, Donna Clara" was published in thirty countries, it was promoted on Brodway by Al Jolson, it was sung as the finale of one of the greatest revues "Casino de Paris", "Niebieska chusteczka" in Russia known as "Sinij Platochek" or "To Ostatnia Niedziela", which is performed on records and concerts vocalists, actors, music bands, chamber and symphony orchestras. The hit "To Ostatnia Niedziela" was used among others in films - "Lista Schindlera" by Steven Spielberg, "Utomlonnoe solnce" by Nikita Michałkow, or "Trzy Kolory - Biały" by Krzysztof Kieślowski.